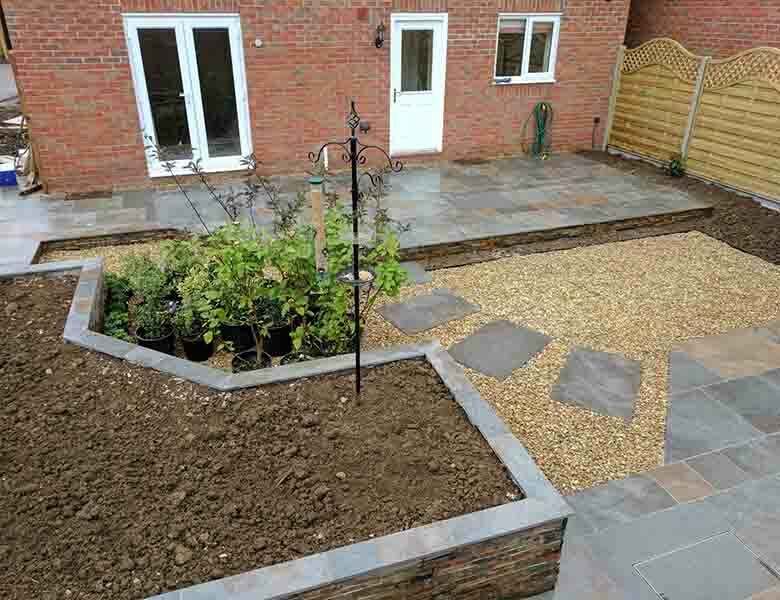 "It has been an absolute pleasure to have Ben and Sam here, and we could not be happier with the results"
As with all newly built homes, the garden was a patch of muddy ground for the new owners to do something with. 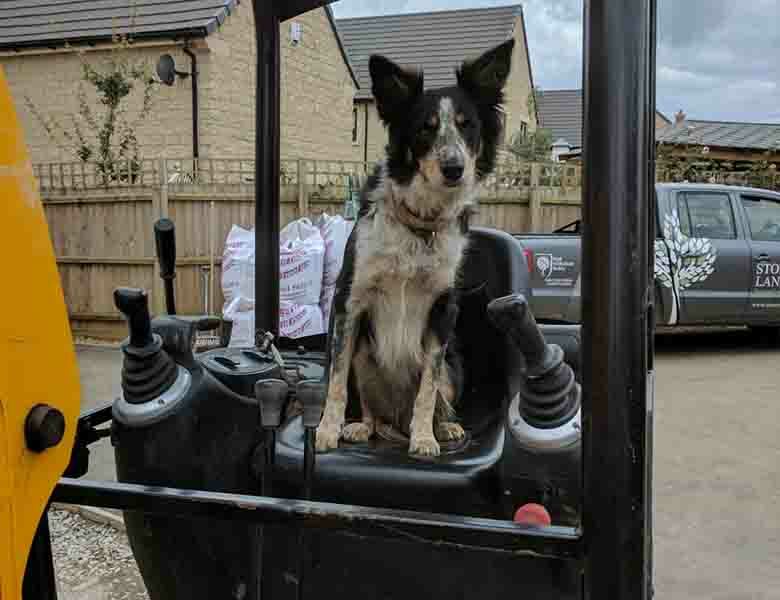 Wanting to create something special, they commissioned Shirley Myatt, a local garden designer based in Langham, Rutland, to carry out the design. We were contacted after the design was finalised to provide a quotation. 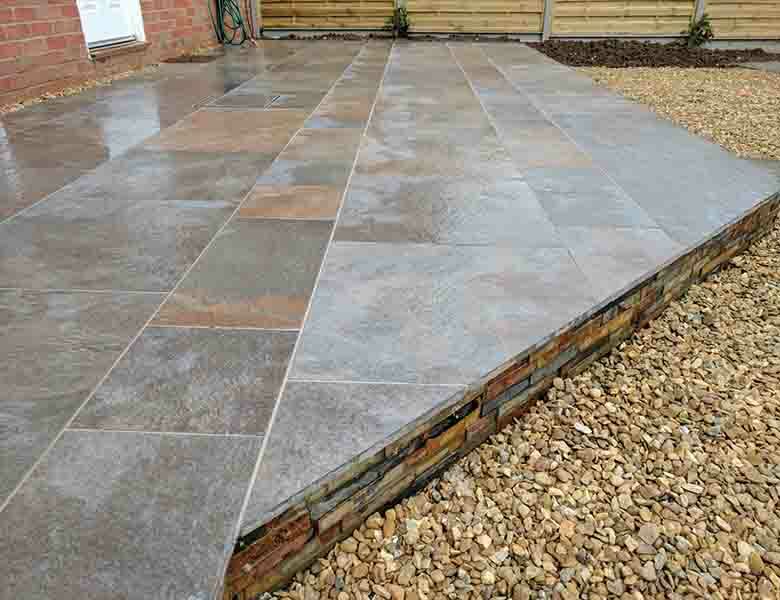 The design comprised of two patios finished using Vitrified Copper Porcelain paving by Stonemarket. 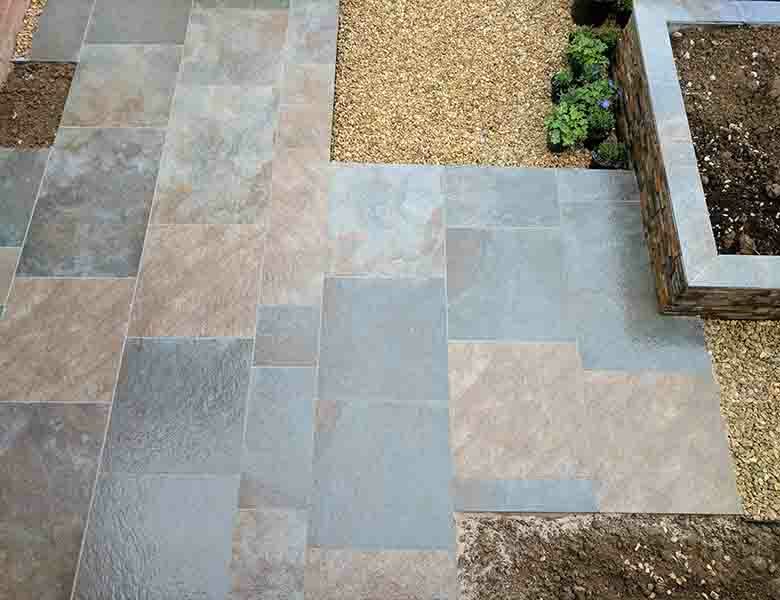 A stepping stone porcelain path with gravel surround linked these patios to each other. To one corner we build a raised planting bed, with the walls clad in Exilis Splitface walling in Copper Slate by Stonemarket that complimented the paving beautifully, a testament to the design. To finish off the wall we cut strips of the Porcelain paving to act as coping. There were a few manholes located within the paving. To help hide these we installed recessed type manholes so that only the rim was exposed. 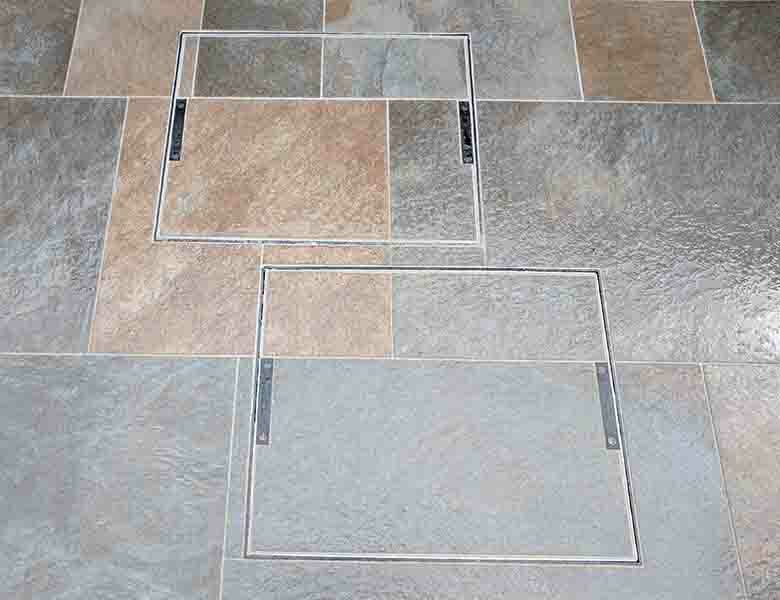 This allowed us to continue the Porcelain and it’s joints seamlessly over the manhole cover to provide a neat finish. Our client took a keen interest in our work, even helping out on occasion and making sure we were kept stocked up with fresh tea and plenty of very tasty homemade cakes, thank you Michael and Sheila! If you would like to get in touch with the designer, Shirley can be contacted on 07941 660476. Her website can be found here. 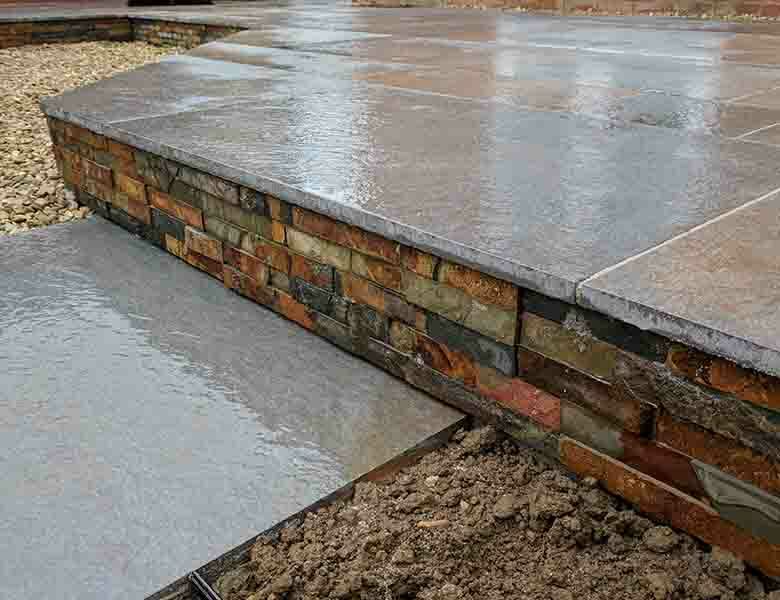 Posted in contemporary, design, gardens, patio, portfolio and tagged gravel, patio, paving, porcelain, raised planter, stepping stones, stone walling, tiered walling, wall.